The fusion on traditional blade design with modern flare and craftsmanship, the Bark River Mini Kalahari fixed blade knife with green canvas micarta handles is able to take on all of your camp and hunting chores. 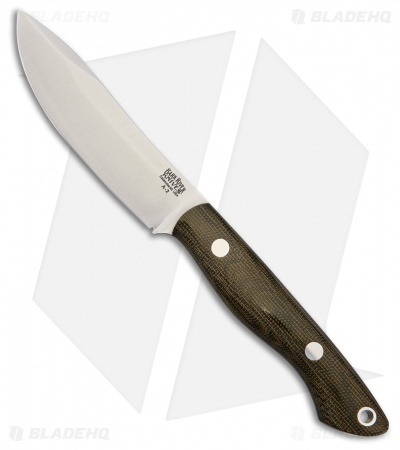 The upswept skinner blade makes short work of any skinning tasks with it's ample belly. A strong tip allows for precise cutting with total control. Green canvas micarta scales have a traditional look but with ergonomic sculpting, you have hours of prolonged use with little to no fatigue. Weighing in at less than 4 ounces, you'll hardly notice it on your belt with the attractive hand made leather sheath.